The small town of Chinchilla lies at the heart of Queensland’s Western Downs, about 300km north-west of Brisbane. This is the undisputed Melon Capital of Australia, producing 25 per cent of the country’s melons (including watermelon, rockmelon and honeydew). Once every two years, in February, the town hosts a week-long festival to celebrate the product that is the district’s economic mainstay. 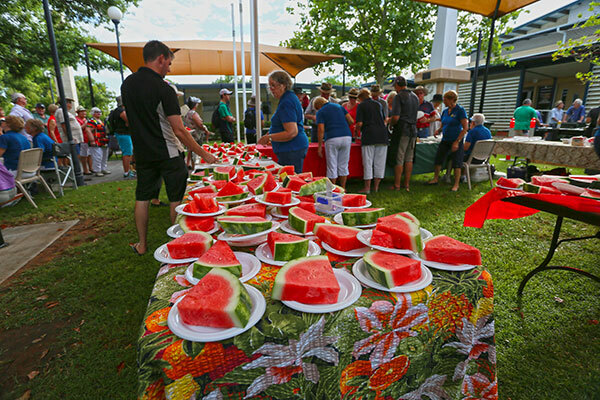 In 2009, the Melon Festival won the Queensland Regional Achievement and Community Award for Tourism Event. The first Melon Fest was held in 1994 to boost the morale of a Chinchilla community that was wilting under long-term drought. 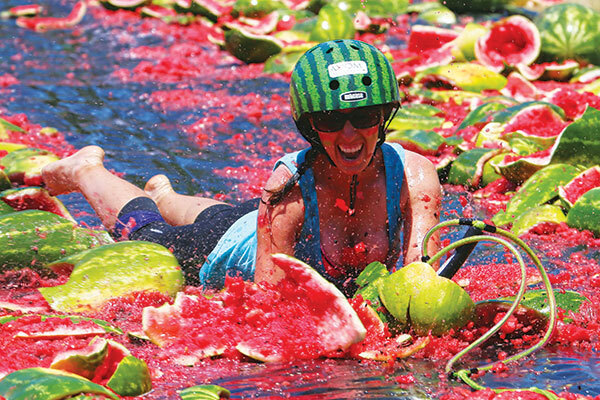 The inaugural event attracted a credible 2500 visitors, but successive festivals have seen attendances grow dramatically to an estimated 15,000 melon enthusiasts in 2017. But how does a rural town the size of Chinchilla accommodate so many visitors? The answer: all the hotels, motels, B&Bs and caravan parks were filled to capacity. 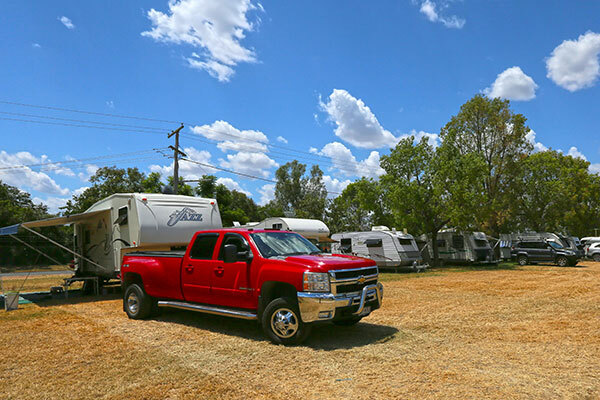 People who had friends in town set up camp in their yards; the 25-acre showgrounds were also opened up with 500 sites (some powered) for tents, camper trailers, motorhomes and caravans and overflow camping was provided for another 160 sites at the Polocrosse Club – all booked out months before the festival began, such is the breadth and depth of hospitality in country Queensland. The program of entertainment during the week leading up to the main show day includes a trivia and fancy dress night; an art competition that saw artist Dion Cross take out the sculpture prize with ‘A Slice of Chinchilla’ (scrap metal welded into a giant watermelon); and a lunch with former Governor-General Quentin Bryce. 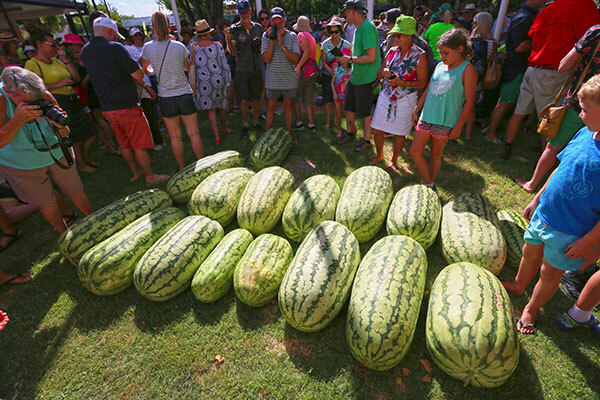 As the week progressed, the excitement factor ramped up with the Melon Big Bash – a night match of 20/20 cricket, in which the Chinchilla District Watermelons went down by 40 runs to the Bulls Masters, led by Queensland legends Jimmy Maher, Andrew Symonds and Ryan Harris. 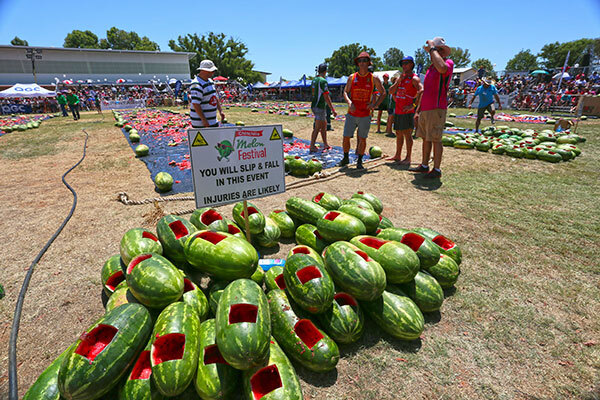 A massive crowd of 5000 people was treated to what organisers described as “the biggest ever” Melon Rodeo, with a record 160 entrants competing for prize-money in excess of $16,000 across a five-event program. Sam Spencer, a baby-faced young fella from Rolleston, Qld, stunned the crowd by winning the $10,000 purse in the evening’s feature event, the Open Bull Ride. For the party animals, the Club Hotel hosted its Beach Party on Railway Street, where 40 tonnes of sand had been spread over the asphalt in front of two stages for entertainment by live bands and DJs until 3am. 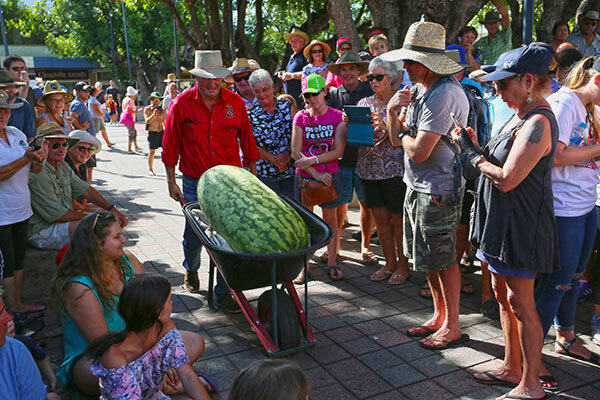 The first melon-based event was the Big Melon Weigh-In on Friday afternoon. Growers from around the district brought their best and biggest product to be weighed in front of a huge crowd of onlookers in Fuller Place. 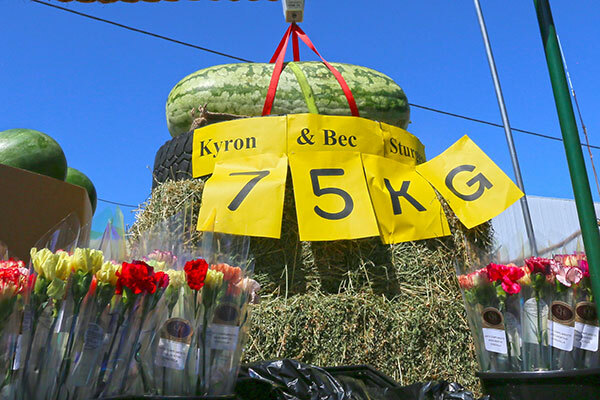 Though well short of the competition record of 87.5kg set in 2007, the Sturgess family was delighted to claim this year’s prize for a whopping 75kg melon grown “just behind the house” on their property north of Chinchilla. What makes the feat even more amazing is that these babies achieved mammoth proportions with only 14mm of rain since planting as seedlings about three months earlier. On Saturday morning, the Poet’s Breakfast was served under the trees in Fuller Place, with some hilarious renditions by bush bards to accompany the bacon, eggs and watermelon. 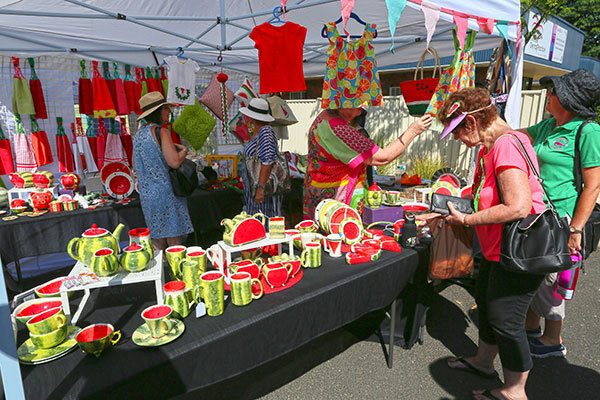 Suitably fortified, the masses dispersed to browse the 200 market stalls that lined several CBD streets, before taking their positions behind the barricades for the Great Big Pink, Black & Green Melon Time Machine Procession. This grand parade comprised a colourfully eclectic mix of vehicles, floats and marchers, stretching for many blocks along the main street. 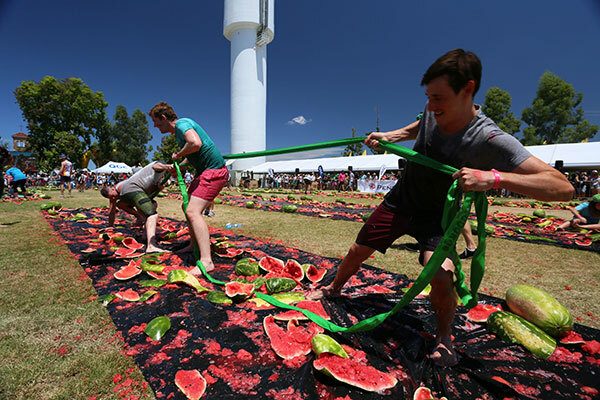 Once cleared, the street was prepared for the Melon Dash for Cash, in which contestants in various age groups tested their fitness by running a designated circuit carrying a watermelon, sized appropriately for age – said melon to be carried the whole way intact. Both adult men’s and women’s events were won by visitors from the Gold Coast – must be something in the water down there. In the afternoon, a program of events kept the crowds entertained at The Arena, on the local school sports field, with Melon Skiing, Melon Bungy, Melon Tug-o-war, Melon Pip Spitting, Melon Chariot Race and Melon Ironman/woman. 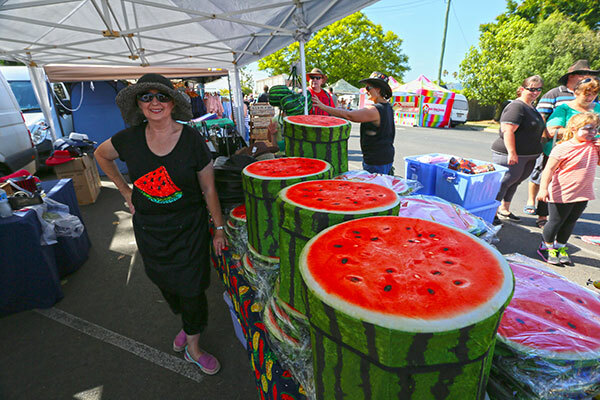 If you’ve never been to Chinchilla’s Melon Festival, do yourself a favour and head up there in 2019. More than 1200 varieties of watermelon exist worldwide, ranging in weight from less than 1kg to more than 90kg; the flesh can be red, pink, orange, yellow or white. A ‘Carolina Cross’ holds the current world record for heaviest watermelon, weighing 159kg (in Tennessee, 2013). In 2012, more than 95 million tonnes of watermelon were produced worldwide, of which China produced almost 75 per cent. Australian melon growers produce 217,000 tonnes annually, across all states, of which Queensland produces nearly 50 per cent; about 11,500 tonnes are exported, mainly to Hong Kong, Singapore and New Zealand. Read the full feature in Caravan World #562. Subscribe today for the latest caravan reviews and news every month!